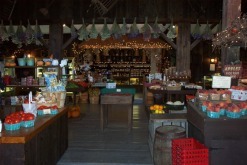 Bolton Spring Farm’s home is a historic barn built in the late 1800s, which offers shoppers a unique shopping experience. While filling your basket with fresh fruit, produce and distinctive gifts, take in the farm and family antiques nestled in the eaves, corners and even the former hay lofts. Every time you visit, you will notice something new (or should we say old). 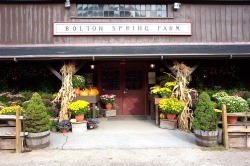 Bolton Spring Farm is open from late July to December 31 annually. The Country Store offers shoppers a variety of native peaches, pears, plums, nectarines, more than 25 varieties of apples and a bounty of homegrown vegetables with more than 50 varieties of squashes, gourds and pumpkins. The farm also produces decorative Indian corn, Indian fingers, broom corn, sunflowers, mums, asters and dried flowers. But, before you fill your basket with our home grown specialties, make sure you peruse our gourmet foods and gifts sections (chances are you will need another basket!). There are just too many items to mention so your best bet is to come in and see it all for yourself! From the tree, to the trimmings to the gifts underneath, Bolton Spring Farm has everything to make your Christmas perfect. Starting the first of November, the farm stand is transformed into a winter wonderland with the picnic area turned into a grove of beautiful Christmas trees in different sizes and varieties to meet the needs of the most discriminating tree shopper. Warm up with our complementary hot cider, coffee and cider spiced donuts as you walk through aisle after aisle of beautiful Christmas trees. 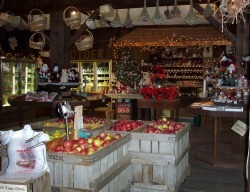 Then, step inside and find the perfect gift, that unique ornament or work with the farm’s talented elves to create a custom wreath. Need a great hostess gift or a present for the real foodie on your list? Then order a custom fruit basket loaded with fresh fruits, preserves, cheese, candles and other food or gift items to create a truly personalized and meaningful gift.